The speed of change during the programme has been amazing says Evelyn Welch – yet it is also surprising that the questions have remained constant, indeed have gained relevance as the programme has continued. “Post-its were very exciting 3 or 4 years ago” says Evelyn Welch at #beyondtext – she wants a replacement! Helen Weinstein and “How we remember the future” a panel session with some video shown to start. Elena Isayev -serendipity is important and beyond text has enabled the space to allow serendipity to emerge. We also learnt how to get complex ideas across to people; including children and providing tools for them to think about things in a different way. Graeme Milne saya that testimony from local people was of a different kind from that usually found by museums – it seemed to be more descriptive and about mobility and movement – needed to rethink how we saw these aspects. The was a real sense of Liverpool’s history and maybe they a thinking bait more comfortably about it’s past. Helen asks about where the collaborations might go. Elena says she is in conversations with other groups around the world. And also talking to the gallery about making apps and involving local school child’s. There’s also a social justice angle. Sandy Heslop – publication and wider work on basketry – new perspectives and working with the existing group of collaborators. Graeme Milne – looking at less formal oral history, less structure and you get people you would never encounter – but it raises clearance and copyright issues. How do we make the content persist and how long do people’s perceptions continue to affect the newer generations. Definition and identity of place. Discussion of place after Rebekka’s question – and how they avoided being sucked into the ‘pop music and football’ aspects of Liverpool. Question on “Impact” and the ref. Elena says her project is an impact case study – though they started it before the REF changes it has become more visible. Graeme says their project will not be an impact case study though those things were built in from the start by e museum partner. Growing into Music: a multicultural study of musical enculturation in oral traditions Dr Lucy Durán Higher Education Institute School of Oriental and African Studies Children who grow up in oral musical contexts such as the families of hereditary musical specialists commonly learn the body-language of music before they learn music itself. From conkers to singing games, rude jokes to fantasy play, Playtimes brings together 100 years of children’s songs, rhymes and games. Explore war battles on bomb sites, rude jokes on council estates, and imaginary TV in the playground, to discover the fascinating world of children’s play. From conkers to singing games, rude rhymes to chasing games, Playtimes brings together a hundred years of children’s songs, rhymes and games. Explore war battles on bombsites, rude jokes on council estates, and fantasy TV shows in the playground, to discover the unique and fascinating world of children’s play. There is a transposition of narrative from physical playground games into digital games – example of clapping games. Use of motion capture to capture forms of movement. Paul Basu talks about representing cultural heritage in Sierra Leone. Creating relationships between museums and people near them and also with museums in the UK. #beyondtext, especially given ‘recording and capturing’ projects of digitising (and monetizing?) heritage. 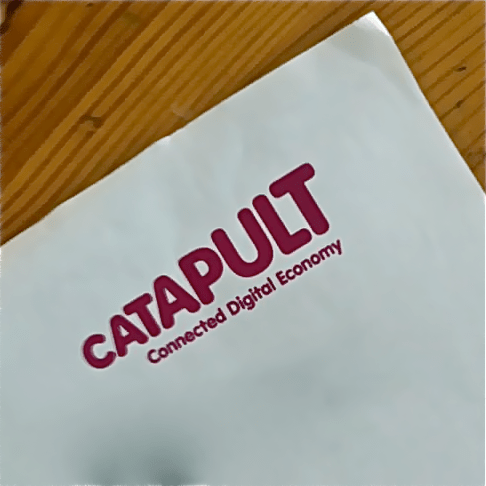 The Technology Strategy Board is consulting widely about the Connected Digital Economy Catapult – “to address the challenges of maximising the economic value of the growing digital economy to UK businesses”. This is an area of great interest to my colleagues and me at the Centre for Creative Collaboration and we have been involved in previous discussions (in the days of the ‘Technology Innovation Centres’). On Friday last, I went to the Information Day held by the TSB as part of the process. Here’s some thinking in the form of an audioboo, based on the Storify summary I produced. My previous post has a liveblog made during the meeting which combines notes and collected tweets from the CDEC hashtag. 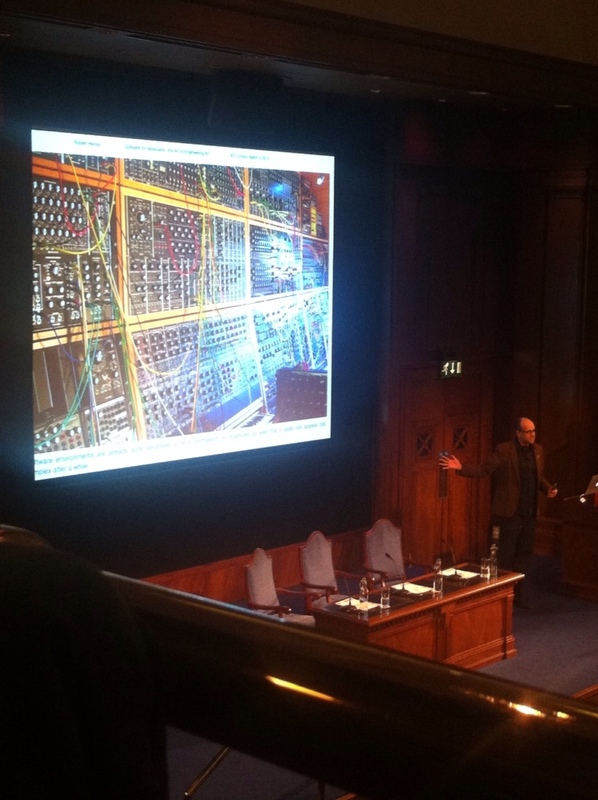 “There is no versioning – there is just the now” says Robert Henke; likening the true expression of digital music-making to the elder days of analogue mixing. As tools and instruments overlap, what does that mean for how we generate music in the digital age using software? He spoke insightfully, introduced by Gerhard Behles, another of the co-founders of Abelton, who also joined in the question session at the end of Robert’s prepared remarks. And it was good thought-provoking stuff. But not one single musical example – which no-one seemed to find odd; and no examples of code or approaches to coding; ditto. And a very interesting way of thinking about the issues – an expression of the psycho-philosophy of making music through coding – the constraints and complexity; inevitable compromises and how to code music without losing the point in the programming and the process. I liked what he said about needing to make data more accessible and human; using techniques of presentation and visualisation to aid insight and interpretation; the presentation of complex data sets as human faces with different expressions and characteristics; the projection of a massive CO2 smoke ring as a representation of carbon footprint of a district heat/power scheme in Scandinavia. And the way he and his colleagues seem to be thinking about the issues looks good, the story he tells is engaging and insightful. Another idea I really like is the BERGCloud – as I understand it, it’s a kind of integration layer between the looming “Cloud” of massive data objects and real things and people. No detail but a great concept. I can’t avoid talking about the Little Printer. The presentation was so compelling that, when we got to the Little Printer, I just thought – ok, yeah, right. It wasn’t until later that I had second thoughts. 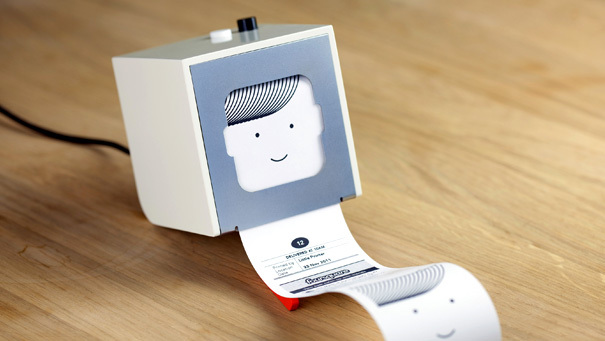 It’s a small, cute looking printer that prints out onto a thermal paper roll (like the receipt printers in shops). It connects to the Internet and you can set it to print out reminders, lists, notes and so on. Doesn’t work for me – but hey; let’s assume it’s a demo of what the BERGCloud might be able to do. 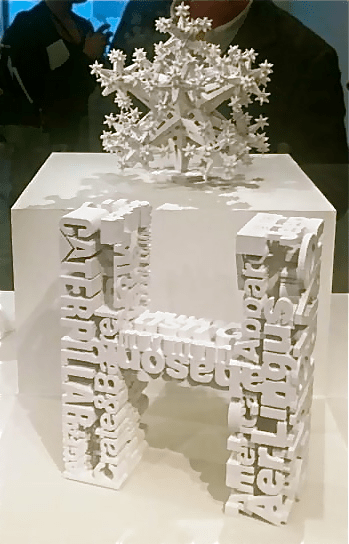 The irony of 3D printing technology being used to print out solid versions of classic typefaces will not be lost on you. It’s the work of Johnson Banks and Ravensbourne and it’s fantastic. Michael Johnson told us the story of how it came about. What I like about it is the fusion of craft (typeface design) and technology. And I remember setting type; composing stick, tweezers for fine point type, quoins, forme. And the smell of the ink and the sound when the impression is made. If you get the chance to go to a ‘Penguin Pool’ – don’t reflect – just dive in!